BWV132: Wege, bereitet die Bahn! Kevin Mallon and the Arcadia Ensemble hail from Canada, and they offer fresh and well judged performances of these cantatas. Following the precedent of Joshua Rifkin, they prefer, for the most part, to keep to a single voice to a part. But they occasionally add a fuller ensemble, to telling effect. Rhythmically light and texturally clear, Mallon judges tempi well, and his singers are at one with his approach. John Tessier is a splendid Bach tenor, for example, and his offerings in BWV36 warrant special mention. And soprano Teri Dunn is equally fine. St Mary Magdalene in Toronto has provided one of Naxos's most successful recording acoustics, and the engineers are to be commended for the natural perspectives and balances, which add a great deal to the effectiveness of the performances. Mallon adds his own instrumental adaptation of the chorale preludes on Nun komm, der Heiden Heiland. The ensemble performs with care and sensitivity, so that the results are entirely appealing. 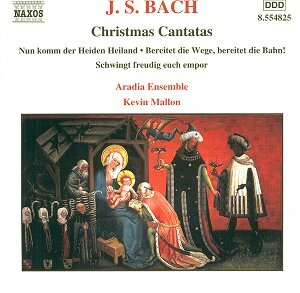 These Advent cantatas are deserving of a wider recognition, and this disc serves them well.